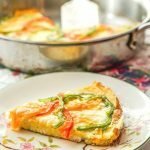 If you are looking for a quick and easy low carb breakfast idea try this pepper & gruyere frittata. It also makes a delicious brunch dish that only has 2.7g net carbs per serving. Or make a big pan and freeze the rest for later. Spray a oven safe pan and heat up on stove. Whisk eggs, cream, salt and pepper and then pour into oven safe pan. Take out and sprinkle 2/3rds of the cheese. Then place the pepper slices on top. Lastly sprinkle remain cheese. Put back into oven and cook 10 minutes more. Make sure it is cooked in the middle.